Hint: control F will let you find a surname quickly. Concerning the Sedro Woolley Union Cemetery listing found at http://www.rootsweb.ancestry.com/~wasvgs/SWCemetery.htm, when the site says “003 004” what does that mean? Is it like Section 3 space 4? researching THOMAS, JENKINS, HAVERY, LAFLAMME/LAFLAME during their time in Skagit County. Can you tell me where I could find an interest in historical photos, that were taken around 1913. My great grandfater had the first car delivered by boat to LaConner. He also had the Hub Livery in Bow with a stage coach run to Edison. The barn that he used for his business was the Gilkey Barn. I have a picture of the coach and barn I have a picture of the car in LaConner decked out in parade fashion. I am looking for any members of my paternal Grandmothers family. My Father and her (and myself) were registered members of the Upper Skagit Indian Tribe and both were born on or near its reseration. My Fathers name was Ellsworth Lang Young DOB@ April 1926 my Grandmothers name was Vivienne Lang she married E S Young they both died in early 1969 here in Oregon. I am looking for family tree info and surviving members of the Upper Skagit Indian Tribe who are related to my Father Ellsworth Lang Young born in Mt Vernon WA in April 1926 to Vivienne Lang (married name Young) and E S Young. She was born on the reservation and all 3 of us are registered members of the Upper Skagit Tribe. They both died in 1969 here in Oregon. I am researching the Sharp family of Virginia. Mary Kelley of Marblemount, WA has done extensive research on this family. Seeking to contact her, or someone with her records. Contact Flora at florabegora@comcast.net. Thank you! STEPHENS, SCOTT, HALL I am seeking information on Alfred Wilkerson Stephens(b: 19 Mar 1887, MO)s/o James Dyre Stephens b: 1850 and Mary Malinda Hall b: 1852, both in MO) and his wife Edith L Stephens b: 10 July 1920 (KA? ), died 20 July 1973, Anacortes, WA. They had two sons, James D Stephens, b: 6 Feb 1920 (Kansas ?) d: 31 July 1985,and George M Stephens b: 12 May 1917 (Kansas? ), died Everett, WA, 17 Dec 1987. I believe this family was in Skagit Co about 1920-1930. I’m seeking information regarding this family or any decendants who may still be living. I have much information regarding Alfred’s ancestor’s. Alfred was the younger brother of Mahala Leanna Stephens, my great grandmother. Thank you for any information. Please contact me at: rsrudder@comcast.com. ALSO SEEKING INFO ON RELATED COUSINS, JEROME SCOTT HALL, JOHN CRMEL HALL, DOCK W. HALL all of whom I believe are cousins of Alfred Wilkerson Stephens who came with him to work in the lumber industry. Hi All, I hope the weather in Washington is nice for all, here in Australia it is very hot! I have a number of issues concerning a family in Washington. Sarah Armstrong (born 1893 England) was my great grandfathers sister. She married Burnett Edington Cameron in Canada and they had two children Phyllis Enid Cameron and Burnett Edington Cameron born in Canada. They went to Washington c1919 and were living in Yakima in 1920. Burnett was a barber. They seem to have divorced by 1930 however as in the 1930 census she is living and married to Fred Sampson in Sedro-Woolley. Sarah’s mother, Sarah Hutchinson died 10th May 1950 in Sedro-Woolley but cant seem to see her in the Sero Woolley Union Cemetery. Is there another cemetery? Sarah and Burnett has another child Jack E Cameron born c1921??? but not sure what his real name is, whether it is Jack and what happened to him or his mother and step father. My grandfather was sent some photos of the family and on it says that Jack was killed in WWII but I cant seem to work out if this is true!!??? I have searched the SSDI for Sarah and Fred but alas, no such luck. If anybody could point me in the right direction for finding more about this family, and if there are any relatives of this family out there, would dearly love to know! Deaths of anyone with the last name of Green or Greene from Sedro Wooley, WA? I am looking for any record on a person named Billy Norg or Billy Nork (Billie Norg or Billie Nork?) I do not know any other information about this person, other than he/she may have lived in Skagit County at one time. I am looking for information about the John Peterson family He was born in Sweden, came to US in 1888, to Cadillac, MI, moved to Bow, Wa in 1901 to run the Bow Hotel. We think he died in the 1930’s. His wife was Nellie A. Parson who is believed to have been born in 1856 in Sweden, immigrated in 1899 to join her husband. They were naturalized in 1910. They were accompanied to Bow by children Emma (Mrs. Victor E. Rasmussen), John O. Peterson, Olof (Pete) Peterson and Nels Iver Peterson. It is believed that Nellie also died in the 1930’s. I am interested in corresponding with anyone with additional information about this family. I found an old photo album in my late parents’ attic. It appears to have belonged to the wife of my uncle Jack Moberg. Her maiden name was Edna Mattson. I believe that her family originated in Finland. Edna died in or about 1951, Jack died in the 70’s. Other than a few photos that include my parents and Uncle Jack, most are of people who are strangers to me and my family. Edna and Jack had no children. I wonder if there are any living relatives of Edna’s in the area who might be interested in having the photo album. I thought I would at least give it a try. It seems a shame to throw this album away if there might be historic, genealogical or sentimental value to some of the pictures. I would be more than happy to deliver the album if relatives can be found. I am searching for someone who’s son was born in Anacortus (1891). If I get his birth certificate, will it tell me her name (I’m searching for her maiden name) and her birthplace? What do I need to do to order his birth certificate? Earl Henry Stanley born 7 Oct 1891 in Anacortus Parents: Earl Frank Stanley and Jennie ? I looking for info regarding employees of the old Northern State Hospital (mental health facility) in Sedro Woolley. Specifically, I’m interested is the old personnel records, shift rosters, payroll records, or anything else that lists employee names during the period from October 1924 to October 1925. I’d also like to find any employee pictures for this same period. Does anyone know where I might find these records or this type of information? If the actual hospital employee records no longer exist, where did employees of that hospital typically live, especially couples? Since most people didn’t have cars back then, I’m assuming it was close by so they could walk to work, if they were not living in quarters on the actual hospital grounds themselves. Did the local newspapers print articles regarding ordinary local peeople, like the names of new people arriving in the area? Since the hospital was one of the biggest employers there, perhaps the newspaper also printed a list of names of people getting hired by the hospital? What about printing announcements when people got married? The couple I’m researching, Robert HALL & Varina MARSHALL, may have married while working at the hospital but I’ve yet to find any marriage record for them (anywhere). Robert (aka Bob) was most likely a male attendant/nurse at the hospital. Varina may have worked there too but I don’t know in what capacity. She was pregnant, finally having her baby after they left Sedro Woolley and moved to Portland, Oregon in about October 1925. She had the baby in late January 1926 but died 2 weeks later in February from complications. She was only 19 years old. Any info or recommendations you can provide is greatly appreciated (Varina was my Grandfather’s sister). Many thanks. MORGAN I need to make contact with any MORGAN in Skagit Co. who is a decendant of Robert Morgan, father of Ruben Henderson Morgan, father of Alice Mertie Morgan, B-13 Feb 1880 in Scott Co., VA. D-5 Aug 1959 in Lynden, WA,who was my grandmother. She married 1. James Monroe Wampler & 2. Bill Fegenshaw. her siblings were Sidney Allen Morgan, Melissa Cordelia, Twins Robert E & Martin L, Martha Elmira and Elisha Perry. I am trying to tie down the parents of Robert, who I believe was Norman Morgan and Anna Bolton. Thanks. Glen Johnson, Shelton, WA. I am trying to find the genealogy for the minook,and carlo families. Obituary for Margaret (Fulton) Fulton who lived in Anacortes from 1897 to 1926. The Truro Daily News, August 31, 1926 PIONEER WOMAN CALLED BY DEATH The passing of Mrs. Margaret Fulton, wife of Fred B. Fulton, Monday at the Anacortes Hospital was not unexpected as her condition had been critical for several weeks. For the past year or more, she had been in poor health and while everything possible to medical science was done for her, the relief was only temporary and her condition became alarming in the past few weeks. Sunday an interne was called in consultation, Dr. Charles McClure of Seattle and an operation was decided upon as the only possible hope for her. This was performed Sunday. She appeared to rally until Monday noon when her condition changed and she sank into a sleep from which she did not waken. The last rites were held Wednesday afternoon at Westminister Presbyterian Church of which she had been a devout member for many years. The main auditorium was filled with friends made during her twenty-nine years residence in the city. The front of the chapel was banked and the casket was hidden from view with beautiful floral offerings. A quartet composed of Mrs. W.V. Wells, Mrs. R. Lee Bradley, Wallie Funk, and Ray B. Lowman sang two hymns “Beautiful Valley of Eden” and “God be With You Till We Meet Again”, and Mrs. Wells sang “In the Garden”. Miss Arlie Whitney was the organist. Members of Chapter W.R.E.O. Sister of which Mrs. Fulton was a charter member, attended the services in a body. Mrs. Fulton was born in Nova Scotia, June 20th, 1867. Her maiden name was also Fulton. She was married July 4, 1888 to Fred B. Fulton and a year later came to the West. For the past twenty-nine years she has been a resident of Anacortes and had been an active worker in the Presbyterian church in all its departments. Rev. Peter McCormakc, pastor of the church, in his address told of the inspiration that Mrs. Fulton had been to him since he assumed the pastorate of Westminister church by her faithful attendance at all the services of the church in the face of failing health. He voiced the sentiment of all who knew here when he spoke of the harmony of her life, the fragrance of her character, her dignity, her lack of ostentation and many qualities that would leave their impression upon those with whom she came in contact. The pall bearers where James Gander, P.E. Olson, P.R. Nelson, G.D. Shannon, E.P. Barker, and Thomas Mairs. Surviving are her husband Fred B. Fulton, a daughter Blanche and two sons, Norman of Anacortes and Roy of Seattle. Burial was in Grand View cemetery. Do you have obituary for her husband Frederick B Fulton? I am trying to locate an obituary for Scott O Sandon BD7/26/53 died 1/7/1998. He lived in Acme but notice members of family in Sedro Woolley. Thank you very much for your help. HARMON & GRACE YOUNGER, Mt Vernon, 1930s-1940s I am looking for any information about my great-uncle, Harmon Williamson Younger, who was born in Arkansas in 1885 and died in Skagit County in 1946. In the 1930 census, he is shown married to Grace (age 39, proprietor of art shop) and living at 313 Kincaid St, Mt Vernon, WA. His WWI draft card shows him living in Arkansas ca 1917-18 where he was an auto mechanic. I have not been able to find him anywhere in the 1920 census, or to find any additional information about him or his descendants. Any ideas or information would be much appreciated. Searching for any information on Sherrill Van Cott or Vancott. I have found death and burial information on the Van Cott/ Vancott family in Sedro-Woolley, but I am hoping to find more detailed information on Sherrill Van Cott’s cause of death. I am also hoping to find photographs of him, perhaps a photo in the Kumtux if he graduated from Sedro-Woolley high school. He would have been in high school somewhere between 1928-1931. Finally, if anyone has an actual address for Morris Graves’ home, The Rock, on Lake Chapman, I would deeply appreciate it. Thanks in advance for any help! ROBBINS & DUFFORD — Montraville (Mont) Robbins and Lucinda Dufford Robbins (Luddy) were residents of Sedro Woolley as of June 22, 1929. They eventually moved to San Diego. Walter Byron Dufford, Lucinda’s brother, may have lived in the area sometime between 1918 and 1922. Walter is my grandfather. Any help will be greatly appreciated. I am looking for any information on a Louisa Kline Sedro Wolley 1912 Thank you…………. Looking for any imformation on Berent Andrew Berentson/Benson. CARRIE LOUISE BRADLEY, born 1876, Missouri, died 1955???? in Mount Vernon, Skagit County?????. She married Leonard Hill Chase in 1936. She was married before to Edward Sprouse. I looking for a death certificate for Carrie Bradley. I was told she died in 1955, but my source is not that reliable (my aunt). Leonard Chase died Oct 10, 1937 in Mount Vernon, so I’m assuming she also died there, but no sure. Can anyone help? HAWLEY, DANIEL FRANK E Born 14 Mar 1869 in Kewaunee County, Wisconsin. Died 26 Aug 1949 Buried in Woodlawn Cemetery, Ferndale, Whatcom, WA (per his gravestone). First seen in Washington state in 1910 census (Leavenworth); found in 1930 census (Bellingham) Married to Lillian Pearl Bridges in 1914, divorced; married Ada Kelly 1 Dec 1934, still married at the time of his death. Was in SP-AM War (per gravestone) NEEDED: – 1920 census – obit – wife’s obit – wife’s burial location – did he have children by either wife? DOES ANYONE HAVE ANY LEADS? Thank you in advance! Im looking for a marriage license or a birth record…Something with my great grandmothers maiden name. William Lawrence Latimer 31 Jan 1901 – 19 Nov 1977 married a Lois E ??? in the Anacortes area around 1919/1920 They had 3 children: William E (Elhanen?) Latimer 1920-1994 Robert Lawrence Latimer 1922-1999 (my grandfather) Richard H (Hezekiah?) Latimer 1923-1972 they were all born in the Anacortes area as well. I’m hoping that their marriage license or perhaps one of the boys birth records will have Lois E ‘s maiden name it. If anyone could help me out I would appreciate it greatly. Thanks so much! Paul Younger-Burlington, Wa. I am the granddaughter of Paul Younger who lived @ 530 Fairhaven in Burlington for many years. He was the owner of “Younger’s Variety Store” during the 1930’s & 1940’s. He was married twice (Margaret then Irene)-I am trying to find out some information on his store…it was before my time. I would dearly love to see some inside photographs or any advertising relating to his business. My father, “little Frankie Younger” was born & raised in Burlington…I wonder if some ‘old timers’ would remember him. He dumped a whole truckload of strawberries in the middle of town one summer!! Hi, My family name is Lisherness, and I’m trying to find out when they first settled in concrete. I know they were one of the first and owned the gas station (shell oil) back then before it burned down. Then they rebuilt as shell oil I believe, I found the 1944 Concrete Year book with the add. My Father was Vaughn Eugene Lisherness, Son of Ralph Eugene Lisherness married to Fannibur Vaughn. My Grandparents and great grandparents are buried in the Lyman cemetery where they moved. In fact, I believe their old house is now the Lyman City Hall. Seeking info on Edward McMackin and his wife Johanna from New Brunswick, who held the orginal land patent on our property north of Sedro Woolley (formerly Prairie) circa 1885-1890. They had two sons Ray and Tom, and possibly a third whose name I haven’t found. Would be interested to know if they have descendants still in western WA. Charles Edward & Marion Carney, Mt. Vernon, both died in 1974, Marion in Oct & Charles in Dec. Charles is my grandmother’s cousin who was born in Marseilles, IL in 1897 the same year my grandmother was born. If you have any information I would appreciate to hear from you, also would like to find where in Skagit Co. they are buried. George I Dunlap (Skagit County assessor in 1962 &66)(d. 9/21/1977) and Elise H Dunlap( d. 2/19/1977) obituaries or publication dates of such. Their child, Mary Elise Dunlap married Archie Duane Hove and had one child but I cannot find who this child is- I am hoping their obituary may shed light on this. I am looking for information about my ancestor Eliza Louise Gokey Coddington. She was born in VT in 1858 and died in Seattle in 1938. By 1889 she is listed in the Pierce County census along with her husband, William C. Coddington. In 1891 she had a son in Fairhaven. The 1900 census shows them in LaConner, the 1910 and 1920 censuses show them in Sedro-Wooley, and she was in Seattle by 1930. Walter died 1917 in Sedro- Woolley. They had 2 children. Regarding my great-uncle Louis Augustus Record born 3/29/1880 in Sutter Creek, Amador County, Ca. I found him in 1910 in Cullum, Skagit County under the name L.A. Record with wife Martha in later censuses listed as Laura M. (Martha). I now know he wasn’t in Washington before the 1900 census because that census had him in Sutter Creek, Ca. He wasn’t in Redding, Ca. before 1915 so it’s safe to assume he was in Washington longer then I previously thought. I know his sister Olive S. Record married Mark E. Gilkey on 12/27/1907 in Edison,Wa. My grandparents (Patrick Michael and Ruby Matilda Murphy) were possibly living with her step father Albert J. Trottier in Blanchard in 1921. Possibly my grandfather and Albert Trottier worked at the Blanchard Mill. My father William Patrick and his sister Sarah Josephine Murphy were ages 2 and infant then. My father was in the first, second and/or third grade at the newly opened Sedro-Woolley grade school somewhere in the 1925-1927 time frame. I’m interested in any info someone has on these families! Shawn j. Murphy Ps: As a reminder to a previous posting my Great-Grandmother, Seraphine (Sarah) Trottier is buried in the Bow Cemetery in 1907. I know absolutely nothing of her time in Skagit County or her death. James Arthur McCleary (b. 17 May 1871 d. 1965) was a resident of Mt. Vernon and possibly other Skagit Valley towns. He and wife Lucinda Nancy (Bearden) McCleary had 4 sons, Fordyce McCleary (b.12 July 1912 d.25 Apr 1867), Clarence J. McCleary b. 22 May 1915, Cecil G. McCleary b. 1918 and Rex McCleary b. 1933. James Arthur McCleary was my grandfather Lorin D. McCleary Sr.’s brother. I am trying to locate and make contact with Rex McCleary or any of the descendants of these 4 sons. 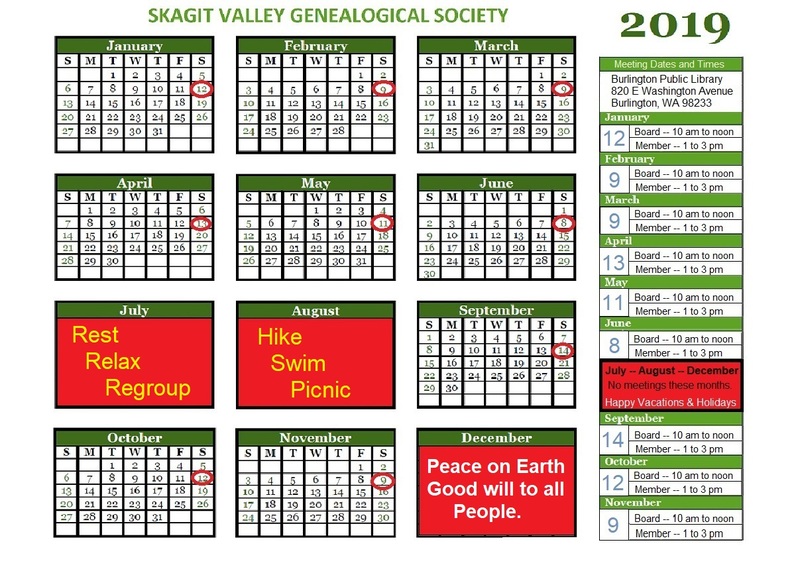 I believe it likely that there are a number of McCleary descendants who still live in the Skagit Valley, possibly in Everett, Marysville or Mt. Vernon areas. Any help appreciated! Lucius and Grace Mabel (Richards) Laraway are reflected in the Skagit Pioneer Book. Lucius was born 16 Jul 1882; d. 28 Mar 1950. Grace was born 19 Dec 1879; d. 26 Sep 1953 (both died in Anacortes). Both born in Will County, Illinois. Lucius is my Laraway Grand Uncle; Grace, my Richards Grand Aunt. It would be greatly appreciated if someone could do a lookup, & let me know which cemetery they are buried in. Thank you! LORENA CELESTE SWARTWOOD – I looking for information to validate that my grandmother was in fact born in Mount Vernon, Skagit Co. on 01/06/1898. Her parents were Harry N. Swartwood and Mother was Elizabeth C. Chamberlin/Swartwood. I have checked with Skagit Co. Records and they had no information on her. Thanks for your help. I am searching for the death info on my ancestor, GEORGE W. PERKINS who may have died in Skagit County in 1907. His widow and family was found in the 1910 Federal Census in Conway, Skagit County. He was born in 1848 in Missouri. If anyone could provide information on Harold Schulmeyer it would be great appreciated. I am looking for information on Harold Schulmeyer. Can any one help me? I am looking for any information on a childhood friend, Shannon, she apparently hung herself in the family barn due to a severe depression and sexuality struggle, this happened in 2000, 2001, maybe 2002. She would have been 19, or 20 and her family lived in Sedro Woolley. She attended BEHS her senior year. Long blonde straight hair, …ahhh, not sure what else to describe. Just want to figure out a full name, and a date. Thank you. Do you have a Skagit County cemetery transcriptions for sale? I would like to assist with Findagrave photo requests w/o heading to the library for each one. Used books would be fine. Thank you for this site. Your page helped me locate information on my great-great grandfather, that I’ve been searching for my whole life. To anyone related to “Louis Normand” and “Marjorie Dishaw”, I would love to share information. I have a webpage with family genealogy background history on the families of both Normand and Deschamps (Anglicized to “Dishaw”), with their ancestry charts. Please email me if you would like the link information to locate the Family Tree on Facebook. Louis Normand was one of your early pioneer settlers and died in Skagit County, Washington. One of his sons was Francis Normand, who married Lucianna Carriveau, the daughter of Philip Corriveau. Francis Normand died in 1952 in Seattle. Francis Normand would be the brother to my great-grandmother. Francis Normand died October 02, 1952 in Seattle, WA. Lucianna Carriveau Normand married 2nd to August Carl Moeschler in Seattle, WA. John Zacheries, Marblemount. He is shown on the John Parsons survey of 1895. (Lot 2 Section 32, TWshp 32 Range 11) I own part of this land now and am researching prior owners. Thanks and I love you web site! Looking for info on the parents of George w Fulton b1890 broad top pa. Parents maybe David and Hannah. Was told it was a family secret and was taken to the grave. Hello, Looking for any information on Charles Little marriage to Carrie (Dollie) , found Census records with Charles Little, husband, Carrie Little , wife and three children! Doris DOB 1916, Gladys DOB 1918 and Harold or Harmon DOB 1921. Any information you may have would be greatly appreciated! I believe that Doris was in Northern State Hospital in a 1940 US Census! I am looking for any family of a Donald E. Fagan who married a young woman by the name Kathleen Ann Kaiser. This took place in October 1960. I understand there was a child produced out of this union. No name but they have half siblings who would like to find them. Looking for obituaries for JONAS JOHNSON born 1835 died 1904 , and his wife MARY JOHNSON born 1838 died 1917 buried Grandview Cemetery, Anacortes, Washington. Were in 1900 Census Ship Harbor, Skagit, Wa, 1880 Census, Smoky Hill, Mcpherson Co, Ks with (7) children: Carl 18, Gust, 16, John 13, Alexander 11, Victor 9, Oscar 6 and Alma 4. 1910 Census has Mary 71 with son Gustavus 45 living in Anacortes, Ward 2, Skagit Co, Wa. Any information on family would be appreciated. I am the great grandson of Gus Johnson born 1847 in Sweden and died in Keokuk, Iowa 1920 brother of Jonas. I am looking for info on DONNA ROBSON who died in 2009. She was married to Frank ( James) Robson and had 4 children… Debbie, Valerie, Dean and Lori. . She lived in Mt. Vernon WA. Thank you. I am looking for a baby girl that was born to a Vernon and Etta Schulte in the 1950’s in Skagit County in Washington State. I am looking for a baby boy that was born to a Vernon and Etta Schulte in the 1950’s in Skagit County in Washington State. HARMON & GRACE YOUNGER, Mt Vernon, 1930s-1940s I am looking for any information about my great-uncle, Harmon Williamson Younger, who was born in Arkansas in 1885 and died in Skagit County in 1946. In the 1930 census, he is shown married to Grace (age 39, proprietor of art shop) and living at 313 Kincaid St, Mt Vernon, WA. Anyone know of living family of Kenneth M. White (11-12-1922 to 1-29- 1997), who was born in Georgia, and lived in Skagit County after WWII? He is buried in the Mount Vernon Cemetery. Was ist der unterschied zwischen kino und fernsehen bitte hausarbeit geschichte schreiben gebt bei der anmeldung an, welche vorlesung ihr besuchen wollt.